On our way home after running this morning, we came across Mónica (our neighbor two floors up), who announced she was headed out to get ñoquis for Sunday dinner, since today is the 29th of the month. 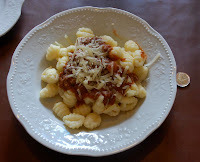 Kurt was immediately energized to also head over to Mas Pastas for 300 grams of newly made ñoquis and a small container of "turco" (meat sauce) for our own dinner on this cool and cloudy autumn day. Ñoquis - the flavorful pasta version of potato dumplings - was brought to Argentina by Italian immigrants and the original name - gnocchi - transformed into something more castellano. And over time the 29th somehow became ñoqui day. There are several explanations as to why. In one version, farmers in a poor area of Italy experienced a bumper harvest because of the intercessions of San Pantaleon, whose feast day is the 29th of some undefined month. Another version says the custom arose from the gathering of Italians to celebrate the feast of Saints Peter and Paul, on June 29th. Yet another, more common explanation, is that the end of the month is a time of short supplies, and cooks made due with whatever was available. In any event, the custom is to place a peso coin or other money under each plate for good luck and prosperity. We, of course, think it is good luck to have a bowl of freshly made ñoquis regardless of what's under it.